We have previously built the Fire Alarm using Thermistor and Fire Alarm System using AVR Microcontroller. Today we are building very simple Temperature Sensor Circuit or Heat Sensor Circuit. 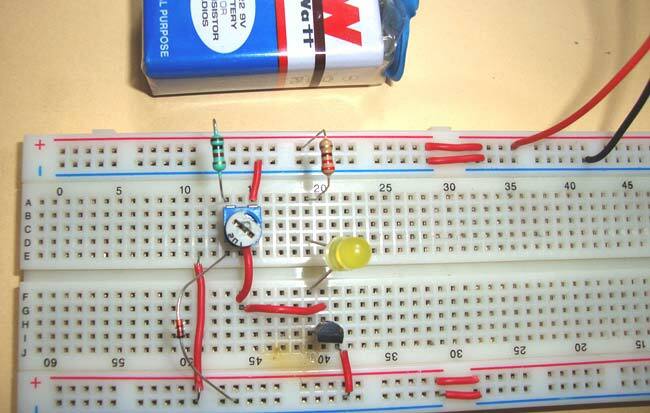 This circuit uses very few and basic components which can be easily available, anyone can build it right away. This Heat Sensor is not only simple but also effective; you can try it at home. Here Transistor BC547 is used as a Heat Sensor. As the temperature of PN junction increase, transistor starts conducting to some extent. This ‘temperature’ property of transistor is used here to use it as a heat sensor. Diode 1N4148 and variable resister of 1k ohm are used here to set a reference or threshold level for the sensitivity of heat. And the sensitivity of the circuit can be adjusted by rotating the knob. Working of the circuit is simple, when there is heat or increase in temperature to the level where it crosses the threshold set by Pot, Then the collector current increase and LED starts illuminating slowly. We can also use Buzzer in place to LED. You also note that, before start testing the circuit, first set the Variable Resistor. When you rotate it completely in one direction, LED will be Off, and when you rotate it completely in other direction, LED will glow with full illumination. So set the Pot at the position, where a slight rotation will start a dim illumination in LED. The temperature dependency of PN junctions in transistor can be understood by the formulae presented here. 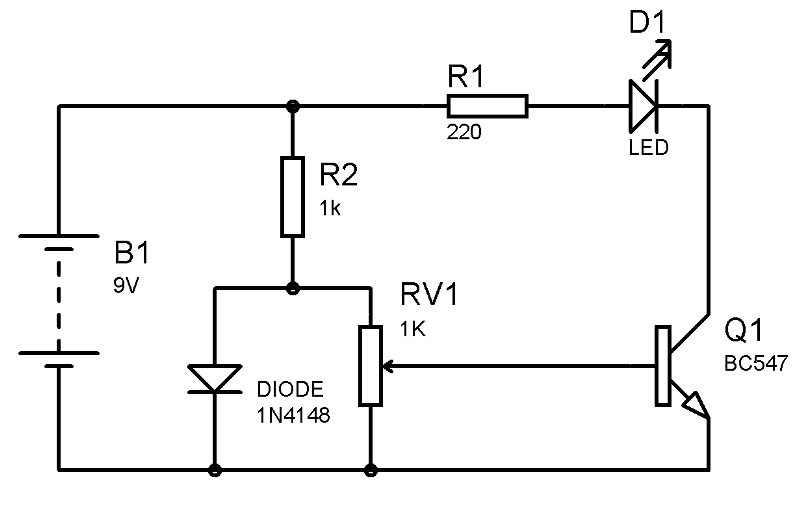 Base-Emitter voltage (VBE) drops approx. -2.5 mV/°C, negative sign indicates the Drop or decrease of voltage across B and E.
Operating temperature of Transistor BC547 is up to 150 degree C, so it can be perfectly used at high temperature as a Heat Sensor. And we can also make a Fire Alarm out of it. can i get the list of the components? please.for our project purpose.. It was a nice and simple project. Such basic projects teaches alot. where is the base of the transistor connecting? resistors got only two wires. what can i use to test the conditions of the transistor am using. i really thanks the engrs, cuz u ar doing a great job here.... but can i order for ur packages? is there any way to power up this circuit using a laptop by connecting a USB. urgent please reply. The picture of the transistor shows "B, C, D", but I think the author means "B, C, E". Can i get the list of components please? Really need it a.s.a.p for my lab project purpose..